Mortar is an inorganic material, but the principle behind 14C-dating of mortar is the same as in 14C-dating of organic materials. Mortar is made by burning crushed limestone (calcium carbonate, CaCO3) in a high temperature until it forms unslaked lime (calcium oxide, CaO), whereby carbon dioxide (CO2) is emitted. The calcium oxide is slaked with water and converted into calcium hydroxide (slaked lime, Ca(OH)2). It is then mixed with water and an aggregate (usually sand, gravel or volcanic pyroclastic materials) to form mortar. When the mortar hardens it absorbs carbon dioxide from the atmosphere and forms calcium carbonate. In principle, the hardening process corresponds to the death of the living organism; the point in time when no new 14C is formed and when the radiometric clock starts to tick. Problems arise if the mortar contains natural carbonates where the proportion of the unstable isotope 14C to the stable isotopes 12C and 13C would indicate a higher age than the binder age. These contaminants can be incompletely burnt limestone in the first stage of the process of making mortar, or limestone fragments in the aggregate. They contain carbon in which the radioactive decay process has started far earlier and where the content of 14C is a practically non-existent, and affect the radiocarbon dating indicating a higher age than the correct one. The reverse effect is caused by recrystallization of the mortar. The method of mortar dating makes use of the fact that the contaminating natural carbonates are dissolved in acid at a different rate than the binder carbonate. 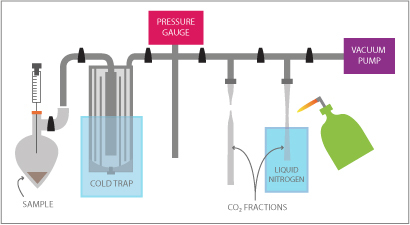 The samples are separated chemically into several consecutive CO2 fractions, which are all dated separately. 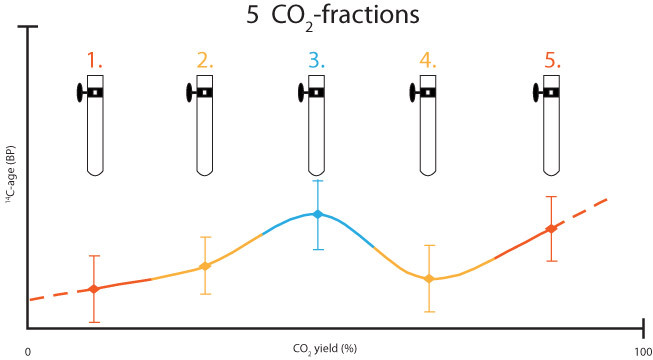 Different carbonates will have different rates of dissolution, so that CO2 from the most soluble carbonates will be isolated in the first CO2 fractions. The effects of contamination will be evident from the age profile created by the dated CO2 fractions. We have modeled the effects of different kinds of contaminants under different circumstances (i.e. 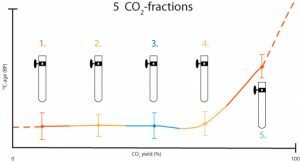 fire damaged mortar) and created models for the interpretation of age profiles and identification of the CO2 fraction(s) relevant for the dating of the sample. The age BP (Before Present= AD 1950) of the relevant CO2 fraction(s) can then be converted into calendar years using a standard calibration curve for 14C dating. The process results in age profiles, which illustrate all stages of the dissolution process. For Åland mortars and for non hydraulic lime mortars in general the first CO2 fractions reveal the correct age. Exceptionally, as with mortars that have been damaged by fire, the conclusive age is revealed later in the age profile. Fig. 3. Example of an age profile with the individual CO2 fractions marked. In this case the correct age is identified in the horizontal plateau at the beginning of the profile. 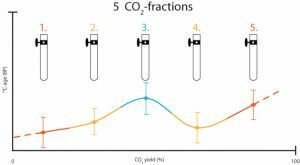 (CO2 fractions 1-4). The contamination does not affect the result until the last fraction. Fig. 4. Example of an age profile, where the first CO2 fraction reveals the right age, while a slight contamination can be traced already in the second CO2 fraction. Our experiences from Åland lime mortar, so far covering more than 150 samples analyzed, has made it possible to formulate four criteria of validity. Simultaneously they serve as criteria for different degrees of reliability and as auxiliary tools in the interpretation of cases where age control from other methods and other materials are lacking, in short – when mortar dating is the only option. To avoid misinterpretations the criteria have been kept as strict as possible on purpose. When the 14C profile have a flat beginning so that the first two carbon dioxide fractions have overlapping ages and together they represent at least 20% of the total carbon yield but not more than 40% ditto (in this case one single sample per building unit is sufficient). Thus, principle Criterion I signifies lack of disturbing contamination. 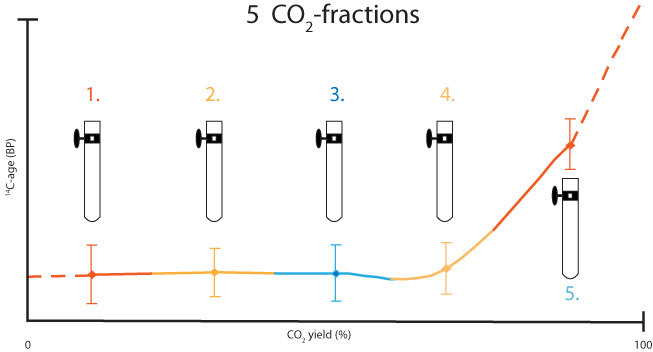 When analyzed in two fractions only: Mutual agreement between the dates between the first CO2 fractions in a series of 3 or more samples from one single building. Figure 5: increasing slope and decreasing slope. 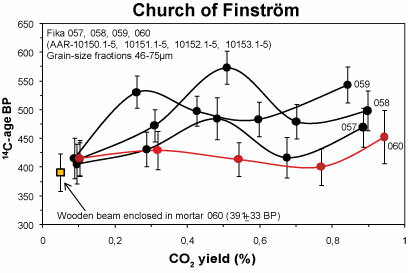 a) When analyzed in age profiles: When two or more 14C profiles from the same building unit display increasing slopes in the beginning and the ages of the first CO2 fractions for each profile are overlapping. Fig. 6. Age profiles from the church of Finström. When the first CO2 fractions coincide in two samples from the same building unit and both C-14 profiles have increasing slopes. When the first CO2 fraction in a C-14 profile with increasing slope from one single sample from a building unit results in an age which is acceptable compared to other building units within the same construction.